Stress ecology, climate change, human well-being, and global sustainability are popular items (Naeem et al. 2009). Given all the challenges in a developing world where the global population is supposed to reach 9.15 billion in 2050 (Pimentel et al. 1999; United Nations Population Division 2010), policy makers are, for the first time, keen on concrete assessments of our world, looking with interest and fear to ecological models. Although the discussion between scientists and politicians is known to be difficult, too many recent catastrophes during a single year - from the British Petroleum oil spill in the Gulf of Mexico (De Gouw et al. 2011) up to the ongoing radioactive Fukushima wreckage (Schiermeier 2011) - rapidly forced a better and constructive interaction between applied ecologists and policy makers at different organization levels. Such an interaction is also reflected by the arising use of internet metrics, blogs, tweets, and social networking - all digital tools that are already more or less linked to the thought process that society and policy are currently going through. Scientists are used to the Web of Science for selecting the appropriate papers, and policy makers are using methodologies for weighing opinions (Bollen et al. 2009). The latter authors even defined modern science as a 'gift economy', and they are absolutely right. What else should happen to improve the interactions between policy and research? 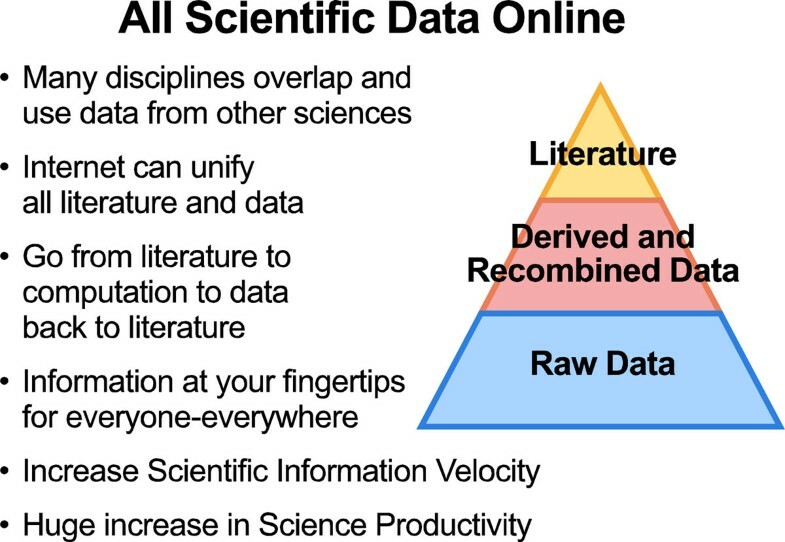 As can be seen in the plethora of data and the huge degree of multidisciplinarity (Figure 1), a full and immediate open access across all disciplines is supposed to be the dream of any eScientist and stakeholder involved in this thought process. At a glance, ecologists should be eScientists par excellence. Most ecological disciplines, in fact, overlap and typically (re)use data from other sciences, which leads to a huge increase in science productivity. Ecology often benefits from methods originally developed for mathematics, physics, and chemistry (Cohen 2004; Elser 2006) and might even benefit from models used in the worlds of informatics and finance (Allesina and Pascual 2009; Haldane and May 2011, respectively). Opposite flows occur as well, from ecological knowledge to archaeology and urban systems, toxicology, and medicine (Sjögren and Lamentowicz 2008; Grimm et al. 2000; Van Straalen 2003; Zu Dohna et al. 2009, respectively). Ecology is a perfect eScience, and I believe that no scientific discipline has already so many examples of mutual benefits as all ecological (sub)disciplines: molecular/evolutionary ecology and genetics, ecology and economics, ecology and geology, ecology and paleontology, ecology and atmospheric deposition, ecology and climate regulation, ecology and environmental planning, and ecology and environmental quality (e.g., Dicke et al. 2011; Costanza et al. 1997; Dommain et al. 2011; Dunne et al. 2008; Elser et al. 2009; West et al. 2011; Taylor Lovell and Johnston 2009; Mulder et al. 2011, respectively). Although most attention is provided to pristine terrestrial biota and extreme environments (e.g., Bai et al. 2004; Yu et al. 2010), ecology provides the necessary knowledge to assess consequences of disturbance and stress, such as the effects of pollution, mining, and engineering on local communities at the landscape level (De Zwart et al. 2006; Dugan et al. 2010; Wang et al. 2010). Moreover, using several case studies from the Great Barrier Reef, Stoeckl et al. (2011) pointed out how important it is to differentiate between information about existing ecosystem services (Adhikari and Nadella 2011) and information about the extent to which existing ecosystem services might change (or have already changed) in response to external events (West et al. 2011). eScience is about global collaboration: a world where data and literature interoperate with each other. (Adapted from Hey and Trefethen 2003; Henzinger and Lawrence 2004, and references therein; photo credit by Hey et al. 2009; free eBook at http://fourthparadigm.org, courtesy of Microsoft Research.). Science is at a tipping point at which research will rapidly become more applied. Land conversion for agriculture is projected to rise sharply (Laurance 2001), and strong empirical evidence is available. Thanks to the huge increase in peer-reviewed publications, ecology helps in understanding what is going on, in sustaining current ecosystems and in managing novel ecosystems, and contributes in the societal thought process. Indeed, nobody is questioning that the entire world of science has changed (Laurance 2001; Hey et al. 2009). From this perspective, open-access journals (ranging from cosmology to environment and from medicine to biology) are for sure the best way to share empirical data, models, and thoughts with others (Bourne et al. 2008; Figure 2). Successful linking of (e)Science with decision making will depend on accuracy and communication (Clark et al. 2001). The entire eScience cycle from data generation to data dissemination. 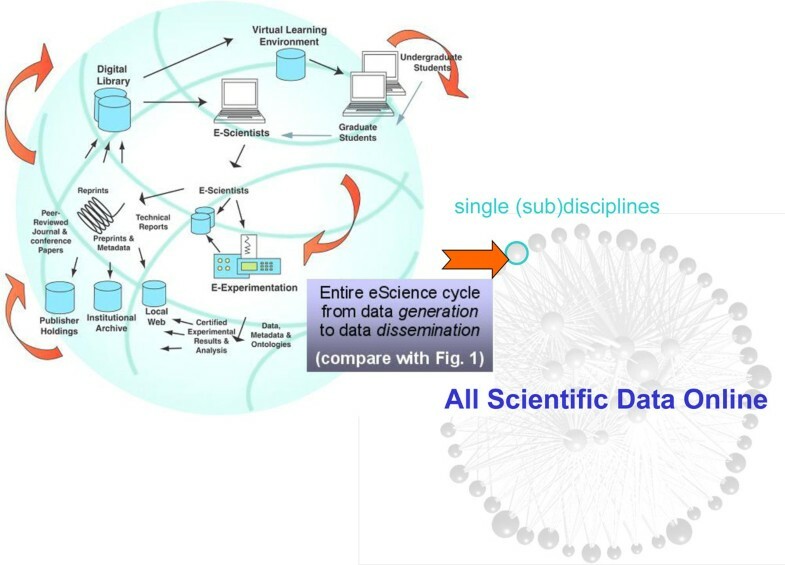 eScience remains linked to the requirements for dataBank procedures, i.e., the quality, integrity, identity, provenance, description, and ontology of original scientific data. (Grid photo courtesy of Liz Lyon, e-Bank, UK; modified from Hey and Trefethen 2005; network credit by Alice Boit, University of Potsdam.). Balancing theory and empirical data at different levels allowed a shift in the scientific inquiries, resulting in an improved performance of current investigation. (Previously, a myriad of topics made navigation more difficult.) Internet, networking, international programs, and the astonishingly high amount of data confluence into this new conceptual framework (Hey et al. 2009), where any traditional (sub)discipline has been forced to change (see Box 1 and references therein; Mulder et al. 2011). Internet can unify such (sub)disciplines in a fractal-like world with increasing complexity and accessible detail (Figure 2), demonstrating the need to unify philosophy of science with the science and technology studies. Albeit some ecologists seem not to be fully aware of the enhancements of online scholarly communication, open access is really beginning to spread. Still, only one-fourth of the contributions published between 2003 and 2010 by the Public Library of Science [PLoS] (2011) belong to the categories Development and Evolutionary Biology, Ecology, Marine and Aquatic Sciences, or Plant Biology, and less than 0.15% of the seven hundreds of thousand contributions deposited during the same period in the arXiv (2011) belong to the 'Quantitative Biology' category. Seeing how many ecologists appreciate PLoS (and open access in general), these relatively low contributions surprise me. Something comparable occurs with data sharing: empirical data sets are of the highest value (cf. Bourne 2005), but ecologists seem to become 'shy' when asked to make their data accessible. This makes me question why in 2010, only 7% of all the participants to one EU-funded project responded to their open data call? This short overview shows, on the one hand, how many ecologists are already dealing with data sharing and eScience, and on the other hand, how different complementary frameworks seem to coexist. The overlap between schools and frameworks can be rather confounding. For instance, although many features are common to different ways of performing research, metadata focusing on compiled information for local communities are widespread as ecological networks, whereas scientific data derived from simulated or empirical information are commonly defined as food webs. This implies that webs can, in most cases, be seen as networks although not all ecological networks may be seen as traditional food webs. However, in contrast to many nested networks, eScience is mutual and, as such, is expected to grow with vigor because, in contrast to (antagonistic) living organisms, eScience has no discrete boundaries but has digitally cross-connected domains with high modularity. After all the efforts of producing a research paper (from laboratory and/or field work up to forecasting, networking, feedbacks, and final writing), how are ecologists currently thinking about their outreach? Bourne (2010) provocatively wrote that in contrast to the rather static PDF interface, publishing workflows - and preprint repositories and post-publication commentaries can be seen as a kind of creative workflows - are more powerful but harder to manage and represent, therefore, a major change for most scientists. Apparently, ecologists belong to those scientists, but if they are not able to keep online the attention of their own colleagues, then how can they expect any concrete feedbacks from environmentally interested laypersons and policy decision makers? How can stakeholders expect a concrete use of ecological indicators if most scientists dealing with such an integrative discipline seem to (be willing to) ignore a large part of data and recent literature on environmental impact and ecosystem services (cf. Bjorndal et al. 2011)? There is an increasing amount of review papers cited to support empirical data, and most results can be interesting for a wide variety of scientists if the original results could be put in a much wider context. Most manuscripts just aim to bridge knowledge gaps, but overwhelming references are always inappropriate to catch real attention, and chains of citations have to be avoided as they move from journal to journal (Hirsch 2005). We should strive to generate less academic papers and attempt to sample the web uniformly. Bibliographic couplings aim to identify structures and communities (Menczer 2004). To avoid strong discipline bias, take substantial precaution. Do not claim shocking lack of knowledge (such terms are not objective) and do not cite only the papers that seem to confirm your results (Jennions and Møller 2002). Your literature shows your horizons. In the framework of eScience, papers always benefit from testing the theory or hypothesis regarding how relationships change, so be wide in the chosen references. Let us put matters straight: ecological forecasts are imperative (Clark et al. 2001). These authors defined ecological forecasting as 'the process of predicting the state of ecosystems, ecosystem services, and natural capital' (Clark et al. 2001). Although some scientists still prefer to claim that no data are available to specify uncertainties or find that novel ideas cannot be tested properly for lack of appropriate technology (cf. Collins 2010), others state that larger data sets (inclusive historic data sets) are meanwhile discoverable (Hunt et al. 2009), making ecological forecasting feasible. Data are interwoven with peer-reviewed scientific papers, are authored in digital form, and are benefits of today's structural use of the entire digital environment (Lynch 2009). As a matter a fact, 'science aims to produce far more than a simple mechanical prediction of correlations' (Ginsparg 2009), and most open-access journals clearly aim to support a better comprehension of the exabytes of already available information and to improve strongly the dissemination of data, causalities, and implications. Therefore, Ecological Processes is governed by three principles: research quality, multidisciplinarity and integration, and open access. (Overarching principles are reflected by all those who have agreed to provide part of their precious time as committed editors.) As editors in chief, we all have plenty of ideas for what Ecological Processes means, but we really wish to get your input too, as you like it.